Sutton means 'South Town (ie. Farm)': south of Abingdon that is. The original Saxon village of sunken-floor 'grub-huts' and post built houses was excavated in the 1920s. It was the first Anglo-Saxon village discovered by Archaeologists and dates from the 5th and 6th centuries. There was also probably an important cemetery in the area for metal detectorists have found high-status gold jewelry there. These were probably the graves of the retainers of the 7th century Kings of Wessex whose palace appears to have been revealed by aerial photography just to the south at Drayton. Its great halls were not unlike those excavated at Yeavering in Northumberland. 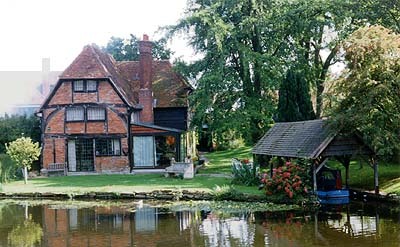 The village is unusual in that it is the home of three very historic domestic buildings. The ancient Manor House is at the focus of the late Saxon manor which was also the site of a Royal palace. The Witan met there in 1042. Most of the present building dates from the 14th & 16th centuries. However, one wing dates mostly from the 13th century and part of it, including a vaulted undercroft, from the 11th! ie. the period of Royal residence. Matilda, Queen of King Henry I came to live here, near her gynaecologist, the Abbot of Abingdon, for the birth of her first child in 1101. Sadly, the baby died, but she stayed on, and it is now generally believed that her second child, the Empress Matilda was also born here a year later, probably in the room above the undercroft. The village name of Courtenay derives from the family of that name who took on the manor in about 1177. Sutton was originally one of their major estates, but they inherited important lands in the West Country and their Berkshire home became less significant. They are now the Earls of Devon, and live at Powderham Castle (Dev). It was Reginald Courtenay, a landless young man from a well known family, who first became Lord of Sutton. He had attached himself to Henry of Anjou (later Henry II) and helped negotiate this young man’s way to the English throne which his mother had lost. As a reward, he was given the birthplace of this very woman. She was the Empress Matilda, mentioned previously. It was Reginald’s younger son, Robert, who expanded on the buildings at Sutton by erecting the house known today as 'Norman Hall' in about 1192. It may originally have been a chapel. It was certainly part of the same complex as the manor house until about 1306. After the family’s move to Devon, they apparently rarely stayed at Sutton and the manor house was acquired around this time by the Brunce family, one of whom became Bishop of Norwich. They, naturally enough, named it 'Brunce’s Court'. It is a very attractive building today, notable for its vine-covered east wing (c.1500) with Ipswich windows that, presumably, explain why the building is painted pink in the East Anglian style. The third great house of the parish was the Rectory House, now called 'The Abbey', built mostly between 1284 & 1290 and incorporating some of an earlier dilapidated Parsonage that had been used as a Grange for Abingdon Abbey. The Courtenays had managed to wrestle the building away from the Abbot during an, apparently rigged, court case! The great timber hall, that survives to full height today, was later (c.1330) clad in great blocks of stone when it began to lean. As an elegant stone mansion, the 'Abbey' made the living at Sutton a very attractive one, luring such men as the chaplains of the Black Prince and John of Gaunt, the doctor of Henry V and the secretary of King Henry VI: Thomas Beckington, who later became Bishop of Bath & Wells. Unfortunately, many of these men were so caught up with affairs of state that they rarely visited Sutton, leaving the running of the parish church to various underlings. The parish church has several interesting features. Note the crusader crosses by the door to the 12th century tower, which were supposedly carved by local soldiers returning from the crusades. They wished to thank god for their safe return while at the same time blunting their swords, which they intended never to use again. The brick Tudor porch displaying the rebus of Thomas Beckington, a carved play on words showing a beacon & tun, reminds us that this was built as his memorial with money that was supposed to go to the poor! Most of the church is 14th century and imitates the great cloth merchants’ churches of East Anglia. It was at this time that the interesting remains of a Norman dog-tooth arch were reset at the entrance to the Brunce Chapel inside. The church also has a fine Norman font. During the Civil War, the vicar of Sutton was a staunch parliamentarian who, with King Charles not far away at Oxford, kept stores of powder and ammunition in the church, just in case. Unfortunately, they were not as secure as he thought and, in 1643, the whole lot exploded, shattering the glass in the windows and damaging the tower. Prime Minister Herbert Asquith and the author, George Orwell, are both buried in the churchyard. The PM was a resident of the village, but Orwell was not a parishioner. He wished to be buried in a country churchyard and the vicar was persuaded by the lord of the manor, David Astor, that such a distinguished author would be a great credit to All Saints' Church.